Haven't posted much due to the fact that my husband's business has been going through installation of new software, replacing programs we had used for 19 years. Wow, it has been a bit painful. The staff have been training since Sunday on the ins and outs of the new stuff. It's ironic, because we are old human dogs trying to be taught new tricks in order to help real dogs and cats (Jim is a veterinarian). I have been training in order to help with their inventory system and as a backup "what do I do when it does this?" expert. Spending this much time on the computer has not been conducive to enjoying blogging. On the subject of change, whether in a vet hospital or in pottery or in life, generally, I was pondering how painful it can be to move out of what you know into something new. I realized that we actually live more in the future than we do in the present or past, since the future becomes the present about every millisecond. So if we do not learn to embrace the idea of change, we are more about digging our heels into what is familiar and resisting the new that is around us every moment. And the new is where the possibilities and potentialities come from. The past is pretty much static and unchanging. So, I'm off to embrace some more future and new stuff! Hope you get to do that today, too. Using up some clay that I had in the studio for the continuing saga of making bowls/teabowls for Bobbie's kiln firing, I worked in porcelain for the first time in a while on Thursday. I had some Helios and it had gotten pretty hard, so by the time I got it wet enough to throw with, it was like cream cheese, but with a bit more life. Actually it felt a lot like bread dough, because it had some bounce to it. I put everything under the fan, so I was able to trim the pieces today. I unloaded the kilns-had a bisque and a glaze. Everything came out pretty well. There was just a bit of pin-holing in my blue glaze, but it seemed a little thick, and that may be why. It was very cold and my kilns are under a roof shed, but still outside, so they did cool extremely fast. Another possibility for the pin-holing. The white stoneware wall hangings really looked great, and I will make some more. Hope to get into studio and finish making pieces for the show in February. They are calling for snow tomorrow. We did have a bit on Thursday, lots on the car, and then everything melted. I hope tomorrow is similar. It is quite lovely to look at as long as it goes away quickly. I do have some nice sketchbooks, but most of the time inspiration and creativity happen when I am not near them. At one time I must have bought about a gazillion spiral one subject notebooks for the kids for school, so I have lots of them at home and the studio. They are usually what I sketch ideas in. Scraps of paper, paper bags and napkins have been called into use in a pinch. I took a lot of images at the LA Co. Museum in the fall, so I will browse through those for ideas. My daily list of things I want to make or throw is another place that will get little sketches. When I go to workshops, I generally don't take notes anymore, unless I think I will not remember something AT ALL. Mainly I try to absorb someone else's technique, compare mentally to what I know, and then figure out a way to use their ideas to enhance my own, rather than copy their work. As my skills have improved, I realized there are a lot of ways to make pots that I am familiar with, so I don't feel like I have to document things as intensely. Sometimes I have found that you can get so bound up in a thing that is supposed to free you (like sketchbooks or computers) that you actually lose sight of the purpose. My dad used to have a big poster in his office that said "When you are up to your rear (insert your favorite term for hind quarters here) in alligators, it's hard to remember that your original purpose was to drain the swamp." I try to keep that in mind so I don't lose sight of my purpose to make good pots that are continually improving, with a certain freshness and spirit injected into them. The weather has turned very cold and seems to be heading for intolerable this weekend. They are even saying the "S" word. Can't say that I look forward to slush, sleet or snow. I glazed today and hope to fire two kilns tomorrow. Didn't get any more cleaning done, but did a bit of carving on trays. Maybe tomorrow will be a catch up day! Some images of work in progress. The first ones are textural platters combining brown and white clays. They have been bisque fired. I have also been doing some larger fish platters. Included is a shot of the teabowls and bowls for Bobbie's kiln firing as they are drying. Everything has been drying very slowly. Lots of pottery build up as a result. Well, things finally reached the crisis point yesterday when I almost tripped over a bag of clay and couldn't find a spot to put a finished handbuilt piece for drying. I was reduced to a cleaning/sort out project that started in my workspace. I got all the slab forms that I use for making handbuilt pieces back in order on my shelves, put away things that had been strewn about and got some order going. Today will be some cleaning in the wheel throwing area. Hopefully I will get a bisque load going and that will cut down on some of the "pots everywhere" syndrome! I did get a chance to work on another large basket and carve the new tray form with one of my "sacred tree" ideas. And I was finally able to make a holey (things with openings as opposed to divine objects) flower vase. Very happy with it and hope to get another done today. My booth display has been on my mind quite a bit. I bought shelving and lights with the idea of changing things, but will probably take these back and stew some more on it. Once you begin to change one thing, it leads to another and lots of cash. So I am sketching little diagrams madly and imagining new uses for the shelving and furniture I already have. I noticed that my previous post had words that were too long and broke into strange groupings that I couldn't control when I was blogging. Too many english classes kept me from just leaving it, so I had to fix them. In the ad/print industry it was bad form to leave a widow (one lone word at the end of a paragraph) and I can't break myself of wanting it to all look good and be correctly spelled, etc. I guess my high school english teacher would be gratified. Now I am really off to make pots. 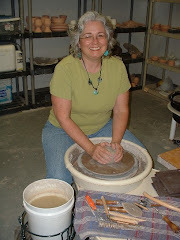 In the studio yesterday to start on work for my friend, Bobbie Black's, kiln firing. I had some really great pots out of the firing last year. I made 16 teabowls and 10 medium bowls, all different. Now they are waiting to be trimmed and handles/decoration done. Some of the bowls will go to several of the Empty Bowl-type fundraisers that I participate in every year. For Bobbie's kiln, since it is a gas-reduction firing, and very different from my electric kiln, I want a bit of a different look. I will probably do a liner (on the inside of cups/bowls/etc) that I tried on the last firing. It was a very nice light amber. Then just use her glazes for the outsides. I had planned on using some older clay that is rated for higher temperature firing than I normally do. I got it out, weighed and wedged the clay and was concerned about how stiff it was. Normally I like my clay very soft, which means using a very light touch with it. After I struggled to center and throw the first ball of clay I decided it was not worth it. Poking holes in the balls and really wetting them down with water and packing in plastic will solve this stiffness I hope. Will try again today, otherwise, back to my normal, nicely behaved Standard clay. Stayed up at the computer at home last night looking at Simon Leach YouTube videos. He is very interesting to watch. Great throwing skills and a dry sense of humor. Perfect combination. I haven't finished any large paintings since my husband's new veterinary hospital was done in 2002. For that I did two large pieces, one group scene of our pets and the other was a lily pond with koi fish in it. I have wanted to get around to a large piece, so I was excited to sketch out the trees for the paintings I wanted to do. These are 20"x30" pieces. I really love the tree images and plan on working in clay on a carved crescent shaped tray using these trees for the Treasures of the Earth show in Shelby. These are some of the paper/mixed media collages I have been working on. I took some of the printed scrapbooking paper you find at craft stores and cut, pasted, layered, painted over and added embossed copper foil. It was an idea that I had been wanting to try for a while. I did 4 more of these, but simplified the others to just paper, either torn, or cut into shapes.